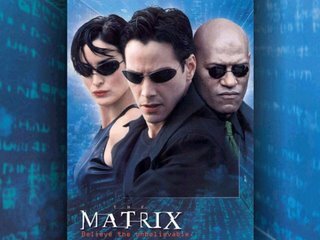 For the sake of all of you who missed the point of the Matrix completely and for those of you who havent watched it at all I’ll summarise the main gist of the story for you. The Matrix is all based on the idea that what we percieve to be reality might not be as real as we think it is. He askes Neo how he would define “real”. Morpheous then proceeds to tell Neo that if real is what we can see, feel and touch then “real” is just electrical signals interpreted by your brain. Neo has been freed from a massive computer program or “game” which all people have been plugged into and are living out their lives in. This computer porogram is simply a “realistic” simulation of life on earth. However, people on earth are oblivious to this tiny piece of information. The reason for this is also explained by Morpheous: in the early 21st century (where we are living today) humans marvelled at their creation of “AI” – Artificial Intelligence. A whole race of machines and robots were programmed with AI. Predictably a war broke out between the two and the humans reasoned that the main source of power for the machines was solar-power and so we scorched the sky. The machines were then faced with a severe power problem. But – the human body generates more bio-electricity than a 120volt battery and over 125000b.t.u. of body head… The machines had found all the energy they would ever need. So they plugged all humans into a simulated reality while they “lived” on the energy produced by the fields of humans plugged into their system. Their were some humans who were freed in the beginning by a certain person and shown the truth and they worked to free other minds enslaved by the system of the matrix. Since it was a computer program, those who knew the truth could manipulate it to a certain extent, hence all the crazy fighting moves etc. Now besides the allegorical value of the story, I think the concept holds some water. (Dont roll your eyes:) I do not believe that we are plugged into a computer program and that this life counts for nothing, but the concept that the Matrix raises does make you think about some of the fundimental truths we know about this life. Firstly, and the most obvious one is that this life is not all there is… we exist on this earth for a higher purpose than just this life. If it were so we are to be pitied above all men. And further more it is our God-Given purpose to show the world the truth… we are enslaved by sin! 1Co 15:19 If in this life only we have hoped in Christ, we are of all people most to be pitied. 2Co 5:4 For while we are still in this tent, we groan, being burdened–not that we would be unclothed, but that we would be further clothed, so that what is mortal may be swallowed up by life. Mat 10:28 And do not fear those who kill the body but cannot kill the soul. Rather fear him who can destroy both soul and body in hell. Joh 3:35 The Father loves the Son and has given all things into his hand. Mar 11:24 Therefore I tell you, whatever you ask in prayer, believe that you have received it, and it will be yours. Mat 7:11 If you then, who are evil, know how to give good gifts to your children, how much more will your Father who is in heaven give good things to those who ask him! 1Co 3:14 If the work that anyone has built on the foundation survives, he will receive a reward. Free will – does it exist? This has always been something I’ve been interested in but my church (Brackenhurst Baptist) had been discussing election when I really started to seriously think about the issue of free will. My dad, who is a pastor gave me a book called “A Primer on Free Will” by John H. Gerstner which really opened my eyes regarding this topic! “Dear reader, you have in your hands a booklet entitled A Primer on Free Will. I dont know you, but I know a good deal about you. One thing I know is that you did not pick up this book of your own free will. You have picked it up and have started to read it, and now continue to read it because you must do so. There is absolutely no possiblity, you being the kind of person you are that you would not be reading this book at this time. A ver interesting introduction I thought! Free means totally uninfluenced by anything, unhindered and free of any boundaries whatsoever. If you think carefully about it, every descision and every choice you make are in some way determined by other factors. Motives. Nothing you do is done without a reason. We, being rational creatures act according to reason, we cannot function without it. Anyone who behaves as if they cannot reason is deemed to be a lunatic. You absolutely HAVE to be reading this post (I’m not just being arrogant ) because your mind is a type of difference engine. You weighed up the pro’s and con’s of reading the blog and it seemed better to you to read the post than not to. You might say now “I’ll prove you wrong and stop reading right now”, but if you study that carefully you find that the motive for stopping would be to prove me wrong and therefore your choice was based once again on a motive. If you decide to do something completely random like punch your screen, you motive would be that you wanted to do something random. So therefore our will will never be free in the true sense of the word. You dont have completely free will because you cannot do everything you will yourself to do. You cant fly because your will is bound by laws like gravity etc. But your will is free in a sense because your motives are based on your personality, morals etc. Therefore your descisions will be inclined a certain way – if you are a good person (saved) you will be inclined to choose to make the right descision because it seems good for you to do so. If you are a bad person you will inclined to choose to make the wrong descision because that will seem good to you. So therefore we do have a freedom and can be held liable for sins and for good deeds, but our wills are certainly not free and are influenced by innumerable factors. Dont you find comfort in God having control over our will though? Imagine if we were left to ourselves!!! I dont pretend to fully understand all of the issues surrounding free will, but I’m pretty convinced that we dont have free will and that God controls our destiny. Hey… I never thought I’d get a blog, but hey – anything can happen!